Are you techy? Do you want to get the latest buzz about gadgets? Then visit the Cyberzone Technolife Affair on March 24-26 at SM Megamall. It will be a 3-day event with a culmination event on Saturday featuring Cosplay Icon, Alodia Gosingfia as the guest. There will also be tons of contests and freebies. 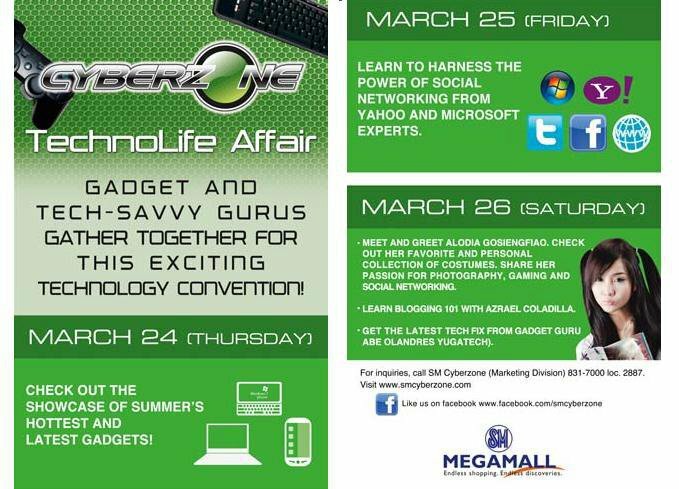 Gadget and tech-savvy gurus gather together for this exciting technology convention! NO ENTRANCE FEE! ➤Meet and greet ALODIA GOSIENGFIAO. Check out her favorite and personal collection of costumes. Share her passion for photography, gaming and social networking! ➤Learn Blogging 101 with AZRAEL COLADILLA! ➤Get the latest tech fix from gadget guru ABE OLANDRES (Yugatech)! ➤Dress to impress and express! Best-dressed guys and gals will win gadgets - NoteBooks, mobile phones and other prizes! ➤Best Photo Contest for Samsung! Samsung prizes await the winners in this contest! ➤Amazing performances from ASHLEY GOSIENGFIAO and the awesome 1:43 PINOY BOY BAND! 3:00PM - Host : Introduction of Alodia; Introduction of the "Best Costume Contest for the Day"
4:00PM - GUEST SPEAKER: Azrael Coladilla - Blogging and Technology; "On-The-Spot Blogging Contest"